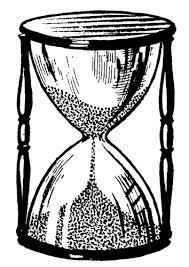 Today in Masonic History we discuss the Hourglass. The Hourglass is an icon of Freemasonry with several different things represented. The first actual sand hourglass is believed to have been invented sometime around 150 B.C. The actual invention of the sand hourglass is murky to say the least. It did not begin to be used in iconography, generally on coffins, until sometime in the 4th century A.D.
For Freemasons it's two biggest representations is time and death. Which leads us to another symbol and,some may say, a principal of the Masonic Fraternity, the Level. The Hourglass representing time can have many meanings in itself. One is that we are all moving forward in time, unable to move the sands backwards up the glass. No matter our station or position that we may hold in life, no matter how many riches we may acquire the sand continues to move from the top of the glass to the bottom. In this matter we are all equal, or on the level with each other. Another allusion that the Hourglass has is death. Sometimes the Hourglass is represented with a scythe further enforcing the concept of death. The scythe has a long tradition, particularly in Europe and the Americas of representing the Grim Reaper or the Angel of Death. It also is associated with the mythical figure of father time. In this allusion, death the great leveler is referenced. Again regardless of station in life or wealth that we have gained, death comes for us in the end. For Freemasonry, this is probably some of our more darker references. It can though be turned around, with the belief in the eternity of the soul. That time passes for us all and that death comes for us all is true. It is through the belief that leading a good, honest and true life that we will be able to one day turn the hourglass on it's side, stopping the flow of time as our good works here are on Earth are recognized.